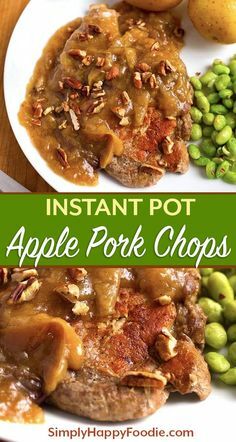 I am trying to type this post early on Sunday evening so it will be ready to go first thing tomorrow morning but we are having intermittent electrical outages. Probably because it is so hot today and it is a weekend so more people are home running their ACs and other gadgets and appliances. Going to type fast and save after each paragraph so I don’t lose what I do get typed when the electricity blinks again. 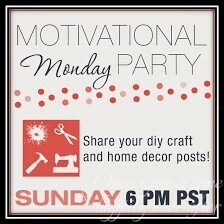 I am linking up with Carrie at Curly, Crafty Mom for Motivational Monday where she shares do-it-yourself (DIY) craft and home decor projects. 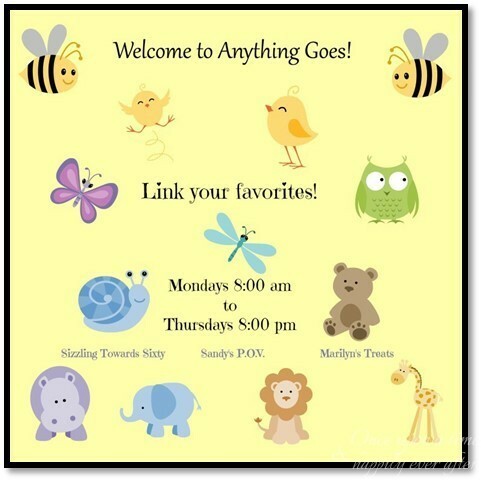 Also linking up for the Anything Goes Party hosted by Sandy over at Sandy’s POV. The little project I am featuring is along the lines of a fancy dry erase board or message board. I found the idea on Pinterest and then kind of fine-tuned it. 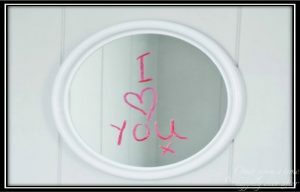 I used to leave messages written in lipstick or eye liner for my daughters and PC on the mirrors in their bathrooms. Kind of like this, however, this isn’t one of my masterpieces. But I realized that I was making more work for myself because the longer the messages stayed on the mirrors, the harder they were to clean off. Now that the girls live waaaaay across Texas, I can’t leave them little mirror love notes so I made each of them one of these little message boards for Christmas. Today I will share the steps with you as I make one for my sweet prince! Look again at the photo above, to see the message board I started to make for us. I got through step one and then stopped and it has sat like that on my craft table for a year or more. I was invited to my friend Martha’s annual fundraiser, “Hobbies for the Cure” yesterday, held in memory of her sister Laura who died with breast cancer about seven years ago. Everyone invited takes a project they are doing and works on it at the event. Quilting, cross-stitching, scrapbooking, weaving. 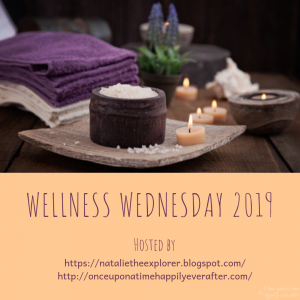 I had planned to take my scrapbooking stuff and did, but then realized I could also work on my DIY for this post there, too. Martha makes the event such fun. We had door prizes and a delicious catered lunch. Everyone there was working on some kind of beautiful craft. It was a great time. I have changed my bedspread since I started the message board for our room so decided to start all over again. It wasn’t like I had done THAT much on our frame anyway! 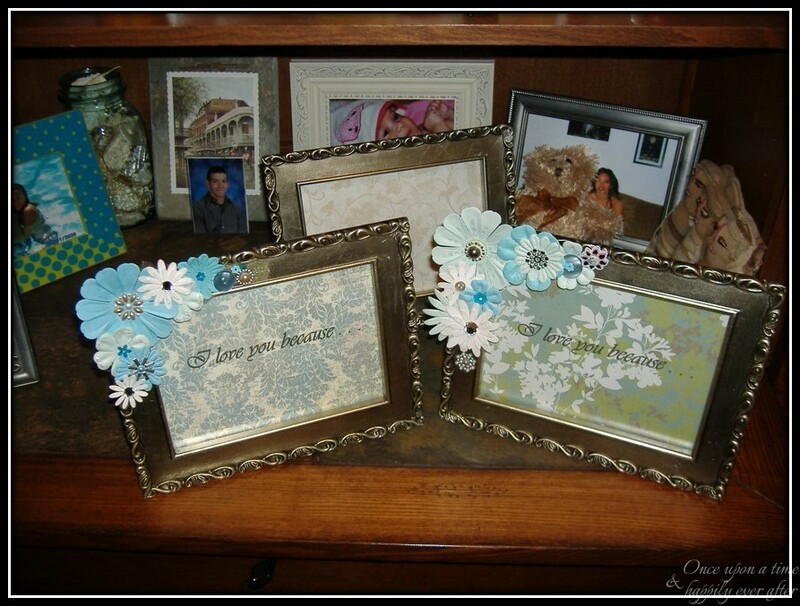 For this project, you will need: a picture frame with glass, 5 X 7 or larger; one piece of scrapbook paper or gift wrap paper a little larger than your frame; embellishments like flowers, gemstones, buttons, pearls; a hot glue gun and glue sticks or craft glue; adhesive letters or a printer so that you can print words onto your paper background. 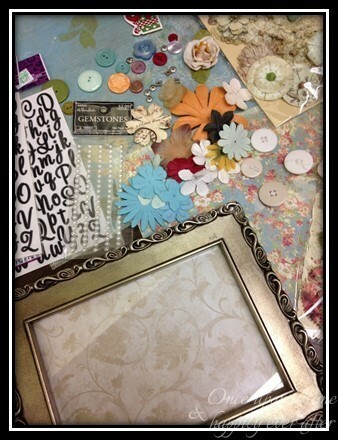 First step was to cut scrapbook paper to fit in my frame. 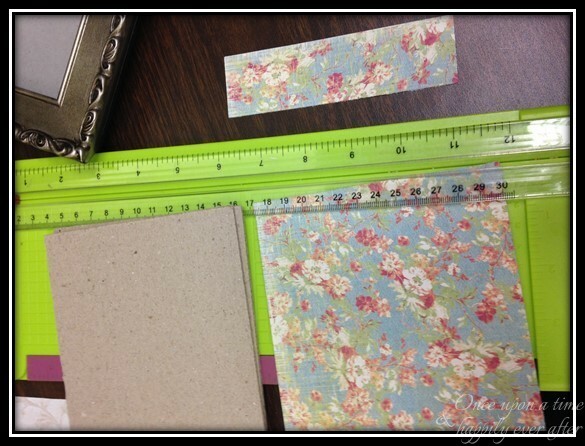 I used a paper cutter but of course, you can just mark off the size you need on the back of your paper and cut it with scissors. I just wanted to look really crafty. I put the background paper into the frame and replaced the backing to see how it looked. 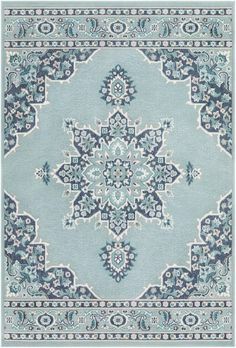 Because my new bedspread has some different colors than the bedspread I was using when I originally bought the embellishments for this project, I decided a little trip across the mountain to Hobby Lobby was called for. I have a lot of scrapbook stuff but never seem able to find what I want when I want it. On my field trip to HL on Friday, I bought two packages of fabric flowers, a package of faux pearls, and two pages of adhesive lettering. Saturday morning, I grabbed up all of the little decorations I had mixed in with my scrapbooking stuff and took them with me, too. After putting the paper into the frame, I was ready to move onto step two. 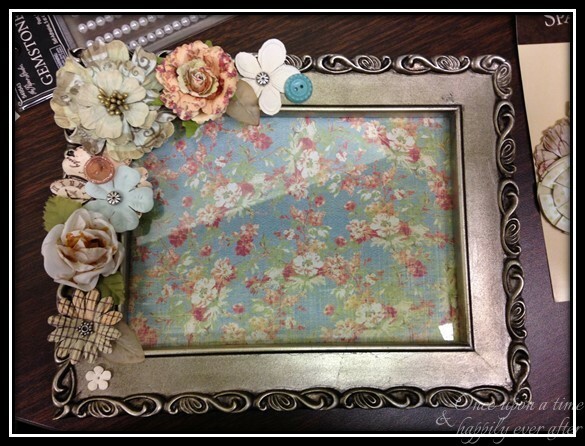 I laid out my embellishments around the frame. I tried different combinations of things until I found an arrangment that I really liked. Once I had everything in place, I took a picture of the layout of the decorations then removed them until I was ready to glue them on. My third step was to adhere the letters of my message onto my scrapbook paper background. I removed the paper from the frame and slid it back into my paper cutter so I could line up the letters onto the paper using the edge to keep them semi-straight. Wow, that is not a very clear direction. Hopefully, the pictures will explain this better. I made sure that my letters were not too close to the top of the paper or too close to the left side of the paper so that my embellishments and the frame wouldn’t cover them up. I used my pinky finger to space between the words and just kind of eye-balled the spacing between the letters. 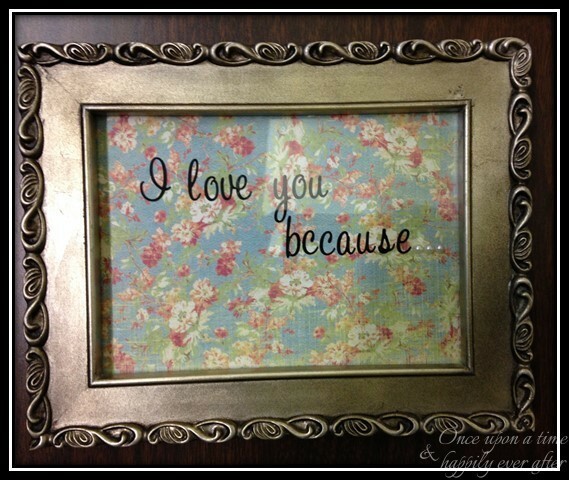 I printed the message onto the scrapbook paper for the frames I made Brennyn and Lauren. In some ways, printing would give you more options as far as the font size and style you can use, but I had a hard time getting the words to print exactly where I wanted them on the paper. It took several attempts to get it lined up right. The adhesive lettering was easier to me but made the project a little more expensive. And a little frustrating by its own right when I realized that I needed one more E than I had in my two packages of letters. Of course, you can be sure to have enough letters if you write out what you are going to say ahead of time and buy enough in the first place (rather than doing it in your 57-year-old head and missing an E like a certain someone I know). I didn’t want to stop there so I stuck a C in place of the missing E and kept on working. Before I quit for the day, I put the scrapbook paper back in my frame to make sure the letters were all readable and somewhat straight. I am so surprised I could think of that word…ellipsis. It will never happen again. Last night after church and Cold Stone Creamery ice cream, we stopped at Hobby Lobby to pick up another package of letters and guess what? There was only one package left. Yikes!! That was a close call. Next time, I have to write out and count the number of each letter I need. But thank goodness, a colossal calamity was averted. I waited until today to make my message right. Step five, I heated up the glue gun to adhere my embellishments. This is the point where I should have looked at the picture I took yesterday to see how I had laid everything out. So, I laid the little decorations out again, in a new way, and began gluing everything in place. I allowed the glue to cool or set for a few minutes while I nursed my glue gun burns. Finally, I used a transparency or water based marker (not a permanent marker) to hand write the reason I love my Prince Charming on the glass. 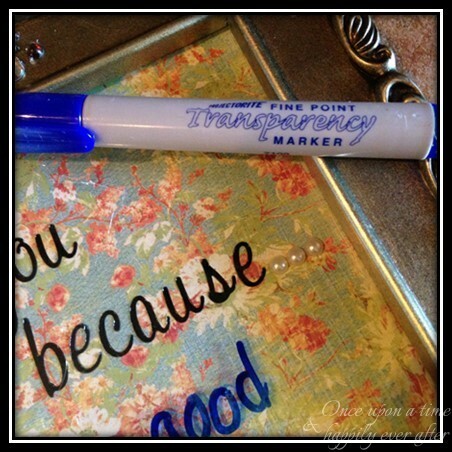 Using a water based or dry erase marker will allow me to wipe off the original message and add something different. But over time, Paul has assured me that in his eyes being a good woman is more important to him than being beautiful or intelligent or funny. And judging from his smile, I think he liked it. I love you for being the good man you are. 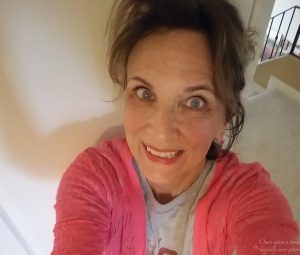 Thank you for always stopping by and reading my blog and leaving me comments to know you have been here. I guess being a good woman isn’t so bad, huh? Love you, friend! I love it. If you need to practice your skills, you could make one for Relay silent Auction. You could even do a super hero theme, “you are my hero because…” On second thought, maybe I will try that. Hey, we can both make one for silent auction next year. I love the super hero idea. I should make you one that says YOU ARE MY HERO because… BECAUSE you are absolutely my hero/heroine. 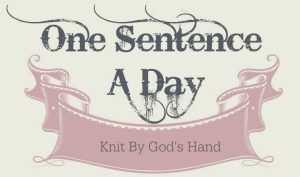 Count me in for making one for the basket! I love you, baby sis. No fair when did PC get dressed? I started worrying that people would think I’m even weirder than I am, so made him pose for another picture with a shirt on. LOL, you make me laugh. I’ve made one before but I didn’t do any embellishments. It’s cute! Gotta love Pinterest for all the ideas! Thank you! It was fun. We are working on how to create something similar for boys. Ideas? This is awesome! 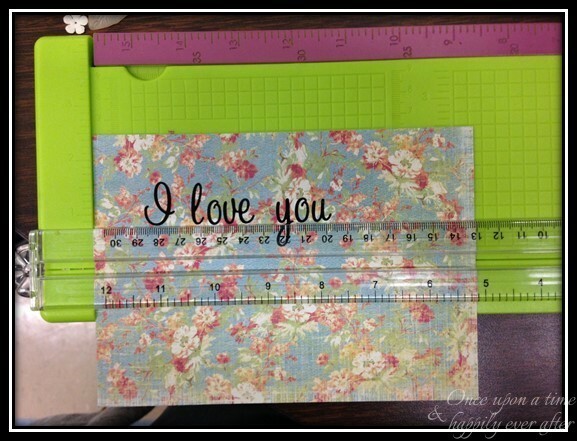 Such a simple idea, but an easy way to leave notes behind for loved ones. Thank you, Danielle. I am going to try to come up with a boy version. 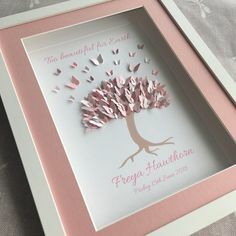 Maybe something as simple as some scrapbook paper that reads “boy” and a few embellishments from the scrapbook aisles of Hobby Lobby. I want to get in the habit of changing my message to PC regularly. I put ours in the master bathroom on the counter where he can see it in the mornings as he gets ready for work, or at night as he gets ready for bed. Thanks for stopping by and leaving a sweet comment. You made me laugh “glue gun burns” not that you got burned but so true when you’re using hot glue! These are great! Love them. That glue gun stuff is deadly!! I usually wind up wrapped in a web of hot glue strings! I cracked up about coming up with ‘ellipsis’! When you first used the word, I thought “Shoot. That library lady is smart!” What a lovely project. I’ll have to remember this one! Ha! YOU made me laugh. You know what? 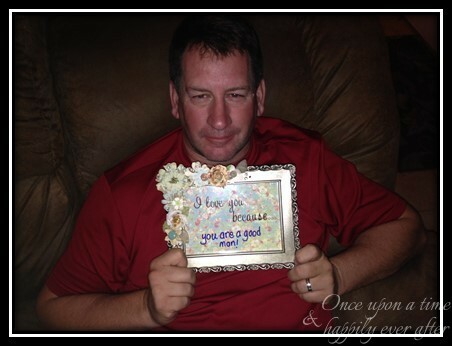 This message board craft could be a cute wedding gift, huh? I think I should make up one and keep it on hand. Not sure what in your comment made me think of that…I think it was subliminal because you and your husband are so obviously in love. 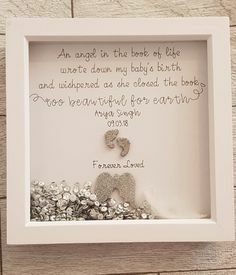 Such a fun idea and I love easily you can change it too! Yup, it would be easy to change out…maybe for the seasons? Like Christmas paper in December, Thanksgiving paper in November. And even the embellishments will pop right off and could be changed out. 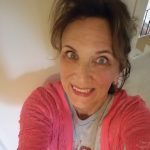 Thank you, sweet friend, for coming by! 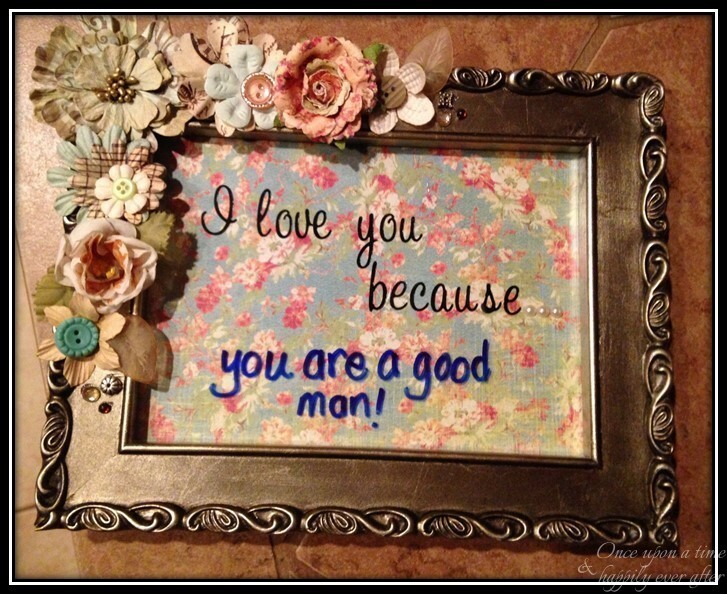 What a lovely gift and a fabulous way to show your man that you love and cherish him. 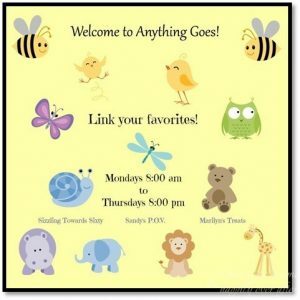 Thank you so much for sharing your post at the #AnythingGoes Link Party. What a great idea, love it! 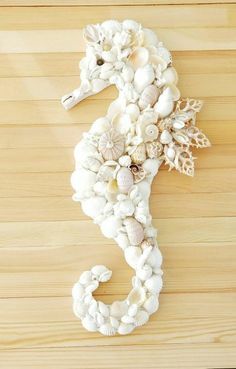 I’m going to make some as gifts soon. Thank you! 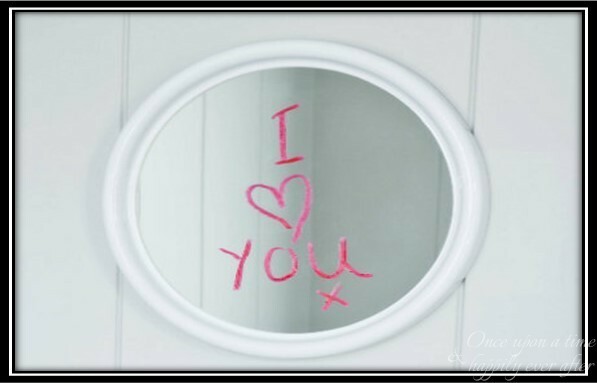 I just changed the message on the one I made for PC to read I Love You Because…you make me laugh everyday. We had such a good holiday weekend and both of us laughed and laughed.